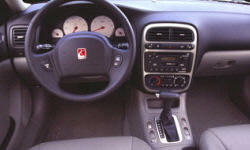 Why the 2003 Saturn L-Series? Handling is good for this size of car. On a smooth highway it is great, supple, feels good. I am getting 22mpg around town when it is not winter and about 20mpg in winter, on the highway 26-27mpg @70mph, loaded for trips. The body is holding up well with approximately 120,000 miles the body is rust free. and the air-conditioning works flawlessly. 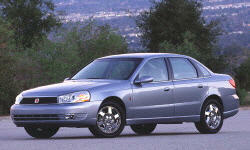 Why Not the 2003 Saturn L-Series? Interior materials suffer from cheap plastic and parts of console that will not align gaps etc., seat base surround broke (plastic). Every lamp has had to be replaced at least twice, every lamp! The car is not quiet because the door seals have torn and can not be replaced, they are not available from the dealer or after market. This has been the most expensive car I have ever owned to keep maintained, many things have broken that have never broken on any other car i have ever owned, this would be an annoyance except for the fact that parts are not available , no front struts, no door seals, I am told that I have oddball sized tires, an exhaust system that leaks ( I think from bad design and cheap materials) , I had the exhaust repaired because at 50,000 miles the only supply was the dealer at a cost of$1,300 for just the two front pipes, that would fail in 50,000 miles. Because GM eliminated Saturn parts are very hard to come by, Dealers will take advantage of you because it not a chevy or a buick. My ownership has not been the happy experience that I had anticipated. I have been let down by a car that appears to have been built to a price, by a company that no-longer cares about the people that bought their cars I do not think I will buy a GM product again. Why waste my money on a car that can not be maintained? Great review!As a former S-series owner, it's really disappointing to hear that the L-series didn't live up to standards of it's predecessor. I had considered picking up an L as cheap winter beater, but a majority of reviews report more or less that same thing about these cars. I would have thought that sourcing most parts would not be a problem, as the car shares so much with the Malibu. Was the dealership just giving you the run-around about this? Anyway, thanks for taking the time to post such a thorough review.